Properties in Waihi average 4.6 out of 5 stars. Property 1: Comfy home opp Gilmour Lake. Property 2: Haybarn House. This house has a round roof. I have an extremely spoiled cat. Property 4: Silverstream Cottage, nestled next to the Mangatoetoe Stream. Property 14: SNAZZY! Right in the middle of the action! Property 23: Family friendly and a short stroll to the beach - you can hear the surf. Property 27: Self contained cottage next to swimming pool. Property 28: Walk straight onto the sand from your garden. Property 31: Stunning, Private, Secure, and Modern Cottage. 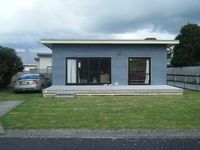 Property 34: Stylish apartment between Waihi Beach and Katikati. 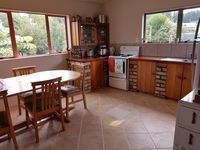 Property 40: The Paeroa Bungalow..
Property 43: Spacious, sunny, modern bach. Property 46: Brilliantly positioned 35 metres from the beach. Stayed here for one night. The house was lovely and warm as the log burner was on when we arrived. The host helen and her daughter played cards and games with my kids all evening which was awesome. Perfect as a place to stay on your way through or as a base.